Many model railroaders use the Atlas solenoid switch machines for remote turnout control. They are relatively inexpensive, easy to hook up following the directions on the package, and they are readily available in most local hobby shops. There are many different manufacturers of solenoid switch machines, but the wiring will be mostly the same for all of them. I just happened to use Atlas because they were more available to me at my local hobby shop. I have worked with both N-scale and HO scale switches and haven't found any differences in the wiring. I have not tried to wire an N- scale solenoid switch to an HO turnout, but I suspect there may be a problem powering the larger turnout with the smaller N-scale solenoid. Each Atlas switch/turnout machine consists of a solenoid which is activated by a momentary SPDT switch. The enclosed SPDT switch is a rather bulky device that is not very well suited for a control panel. It can be done if they are arranged properly on the control panel to roughly correlate with the position of your turnouts on the layout as shown in this picture. 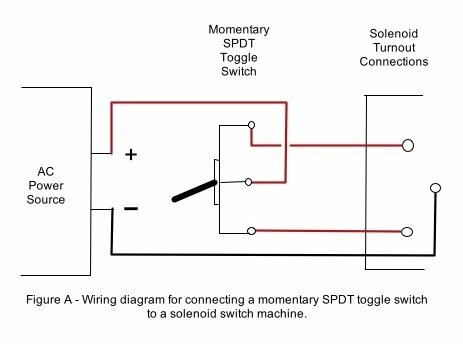 However, it's probably much neater to use small momentary SPDT toggle switches that you can buy from Miniatronics, Allelectronics and other electronic supply companies in place of the Atlas SPDT switches, especially if you have a fairly large layout with lots of remote turnouts. Someone asked me a question recently about how to wire these momentary SPDT toggle switches to the Atlas remote switch machine. If you're not an electronics type person, this might be a challenge to do it correctly. Figure A is a wiring diagram that should help simplify the connections. Remember that you MUST use a momentary switch. If it's not a momentary switch, you will burn out the solenoid switch machine the first time you use it. The momentary switch provides power to the device only as long as your finger is on the switch, which should be less than a second. This is all that should be required to activate the device. If you hold your finger on the switch for too long, it will burn out. You can get creative with these switches and have them activate relay switches at the same time that they activate your turnout so that lights come on or animations occur. You can also hook up 2 or more remote turnouts to one toggle switch. That way you can line up your turnouts with the throw of one switch to allow your train to follow a particular route. You could have several of these momentary toggle switches on your control panel that will direct your train to follow one route or another depending on which toggle you throw. There is a limit on the number of remote turnouts you can control with one toggle switch because if the current is split up between too many devices, there won't be enough amperage to activate them. You may have to experiment to see how many you can activate with one toggle, but it's usually only 3-5. If you have a complicated yard ladder, you can set up a diode matrix that will allow you to throw one toggle to activate multiple turnouts to line up the route to any of the segments of track in the yard. A detailed article has been written on this topic in N Scale Magazine in July, 2008 if you are interested in pursuing it further. Or you can find similar articles online, such as Steve's Railway Pages. Also diode matrix circuit boards are available for purchase at Tractronics. From "Wiring a Solenoid" to "Model Railroad Wiring"
From "Wiring a Solenoid" to "HomePage"